Eltronicschool. - This is very useful software when you want to design PCB layout for your electronic project in this time. This software is CadSoft Eagle Professional Version 7.5.0 for Windows. In this time we will give you global description about this CadSoft Eagle Professional Version 7.5.0 for Windows and then we will give you link to take free download CadSoft Eagle Professional Version 7.5.0 for Windows from external server. This is CadSoft Eagle Professional Version 7.5.0 for Windows. According Applied Electronics Engineering blog describe that EAGLE PCB software provides a schematic editor, for designing circuit diagrams and a tightly integrated PCB layout editor, which automatically starts off with all of the components required by the schematic. Components are manually arranged on the board, with the help of colored lines showing the eventual connections between pins that are required by the schematic, to aid in finding a placement that will allow the most efficient track layout. This pcb software also provides a good autorouter, which once the components have been placed will attempt to automatically find an optimal track layout to make the electrical connections. It does not always manage to find a way of routing all the signals, although it permits manual routing of critical paths such as power and high frequency lines before letting the autorouter handle the other connections. EAGLE is very popular with hobbyists because the free demo is able to create usable PCBs. (Free ECADs from some companies are crippled so that they won't save or won't print.) The only limitations of boards made with the EAGLE demo are: 2 copper layers; a maximum size of 80mm x 100mm (½ Eurocard)(~3in x ~4in). The demo version of the schematic editor module can only create single-sheet schematics. The licensing structure for the commercial version is very flexible. In order to use the demo version to make commercial products, it must be licensed for $49 USD. If more is needed, it is also possible to license the required extra modules (schematic capture, layout, autorouter) separately and simply purchase more if needs change. 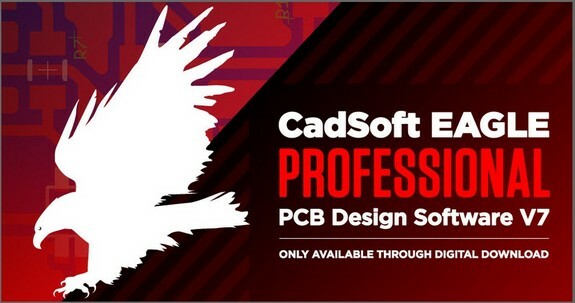 And now you can click link below to take free download CadSoft Eagle Professional Version 7.5.0 for Windows from external server easily.